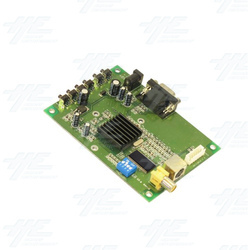 Convert VGA signal to Composite, S-Video and CGA-RGB through this industrial converter. Features pure hardware design with no software driver requirement, compatible with any operation system. Can output a Composite, S-video or CGA-RGB output at the standard 15K video signal. Supports position, size and zoom function. This converter has power conservation via the VESA DPMS method, compatible with VGA monitor power saving settings. Thanks to the true 24 bit A/D conversion process it is able to show true 16. million color conversion. Works with a VGA display of 640 x 480, 800 x 600 and 1024 x 768 resolutions. Can output a Composite, S-video or CGA-RGB output at the standard 15K video signal. Supports position, size and zoom function. This converter has power conservation via the VESA DPMS method, compatible with VGA monitor power saving settings. Thanks to the true 24 bit A/D conversion process it is able to show true 16. million color conversion. Works with a VGA display of 640 x 480, 800 x 600 and 1024 x 768 resolutions. Switchable NTSC, PAL, PAL M, PAL N, PAL combination- supports 640x480, 800x600, 1024x768 display mode. Supports Composite video, S-Video or CGA-RGBH+V output. Supports position, size & zoom function. System settings auto saved power down/up. Power conservation by VESA DPMS method, compatible with VGA monitor power saving. True 24 bit A/D converter for true 16.7 million colour conversion. Container 3 colour wideband amplifier. Buttons for: Zoom, Size, Position, TV system dip-switch selector block.